May was a bit of a come down in comparison to the preceding month. We had our annual family holiday at the start of the month, and the weather held out quite well. Right until the Thursday, when I saw a news report where a farmer was grumbling about the dry spell. He said if they don’t get rain soon his crops would die off. The next day it was raining, and seemed to rain everyday since. I don’t know if he was a magic farmer, but I for one am not impressed with his skills. The following weekend (14th & 15th May) was my first show of the season, All-Types. All-Types is held in the beautiful settings of Bodelwyddan Castle, Denbighshire, North Wales. This show will always have a spot in my heart. It was my first VW show, the first time I met the UK Passat crew in person, and the first show we camped at. This year was a bit of a washout, and despite our ‘Glass is always half full’ attitude to the weather, I think it broke all but the strongest of spirits. Most campers seemed to drown their sorrows, which made for a few sore heads on the show day. The UKP campsite was a great crew again, with old faces mixing with a couple of new. It seemed that the weather also had a massive effect on the Sunday’s turnout, seeing numbers reduced massively in comparison to previous years. The show report and pictures are here. Roll on The Gathering and hopefully the weather will play ball for our annual mega meet. The 22nd May saw vwnutant and I participate in a charity bike ride for the British Heart Foundation. We managed to raise a fair balance for a good cause, would have like to raise more though, so I am now in training for a 50mile ride hopefully we can raise even more money this time. For a write up on the days escapades check out the thread here. For bank holiday weekend we went up to Blackpool, to work on my motor under the watchful eye of my adopted master, Craig (Carmegeddon – Stealth Automotive) May I take this opportunity to publicly thank him and his family for putting up with me and mine for the weekend. The weather seems to be bucking it’s ideas up, so hopefully you will all have a great June. Fingers crossed! This months title, as voted by you guys, went to Vardo and his every evolving B5 wagon. Currently sporting a contentious satin paint job, and some wonderfully contrasting cream BMW X5 alloys, it truly is a car worthy of the title. This car has also managed to get a couple of shots in PVW!! Many people want to add a link to their post, which is allowed on our forum, but one thing that has always slightly annoyed me is that when you click on that link your Ukpassats page gets overwritten by the linked page. In the days of tabbed browsers there is no need for this to happen as a new tab can be opened (hence the name) and the page loaded in that tab. 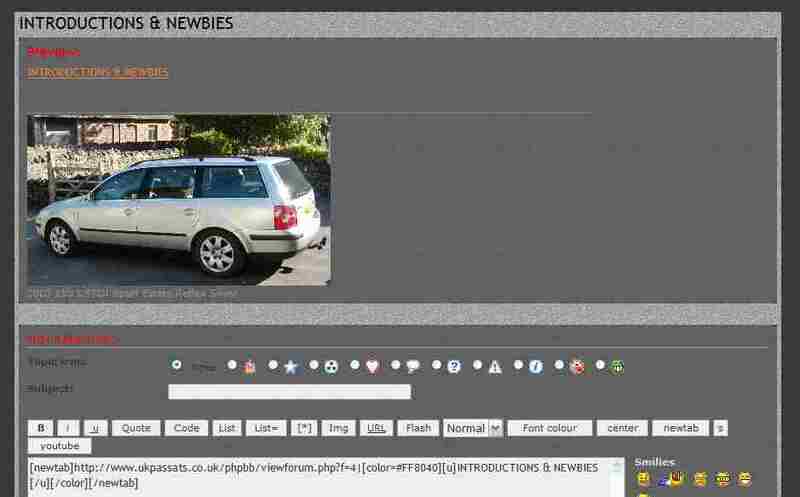 Since you cannot write HTML directly in a phpBB forum post text box I have set up a new custom Bbcode called new tab which is available in the menu above the posting text box (see below). To use it click on it and [newtab][/newtab] will appear in the post window (see below). Then add the Title you want to call the Link (see below). You can optionally add font colour and an underline to make the link stand out by highlighting your Link and click on the Font colour button and then highlighting it again and clicking on u button (see below). And finally you can submit your post, which will look like this (see below a preview picture of the code and the post). and when clicked on the link will open in a new tab or page depending on your browser setup. I have also noticed that some people have tried to add multiple image URLs to one piece of Bbcode i.e. I hope that helps and if anyone wants some other types of BBcode to replace a piece of HTML that you would like to see in the Post area let me know and we will see what we can do.